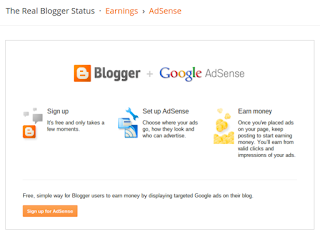 How do I activate AdSense, on my blog? The activation process does not require a lot of additional work, by the blog owner - but it does require a mature, well written blog - and some patience. And you do need to understand the rules of AdSense accounts. A new Blogger blog can be setup for AdSense, quite easily - though some quality standards are relevant. A mature blog, 6 months old, is required in many countries. 50 quality posts - informative, interesting, and unique. A blog published to a non dynamic template. A blog published to a BlogSpot URL - unless you are upgrading your account. A solid stream of organic traffic. No serious advertising company is going to pay to host ads on a new blog, with no readers, search reputation, and organic traffic. AdSense requires 6 months of regular publishing, for blogs in many countries - and even when not required, that threshold still is relevant. With no organic and steady traffic, a blog won't get any money, anyway. Whether the blog is 3 months, 6 months, or a year old - no traffic == no payments. Work on content, and on getting readers. 50 quality posts - informative, interesting, and unique - in wanted subjects. Without 50 well written posts, 200 - 500 words each - informative, interesting, and unique - the blog won't get readers or search reputation. No readers + no search reputation == no traffic == no payments. The stated requirement - 50 quality posts at 200 - 500 words / post - is known to vary - but it's a good guideline. The process which chooses ads, for your blog, requires the text - in volume. No ads == no payments. Any content forbidden by Blogger, and discussed in [FAQ] What Types Of Blog Content Are Considered Abusive, By Blogger Spam Mitigation Policy?, will almost certainly be rejected by AdSense also. Study the "Content guidelines", in "AdSense program policies", carefully; they are very explicit. Even with an approved blog, ads are not guaranteed. Also consider that ads may not be consistently available, for all blogs. Ads are based on blog content - and there are more blogs than ads available. Besides blogs with prohibited subjects, which will never get ads, there are blogs with unwanted subjects, which will seldom to never get ads. When you setup a Blogger blog, and publish to BlogSpot, you use the dashboard wizard on the Earnings page, to setup a Hosted AdSense account. If you already have an AdSense account, you need to understand the AdSense account rules. Don't ask what is required by AdSense. What is required only qualifies you to apply to host ads - it does not offer any income. A blog which uses GPT (PTC, PTS, PTV) generated activity, to get traffic. won't be accepted - or if already accepted, won't receive payments. Again, no traffic == no payments. Traffic must not involve paid visitors, reciprocal visitors ("You surf my blog, I'll surf yours! "), or self generated traffic. Clicking on your own ads is absolutely forbidden - and when (not "if") detected, will result in payment confiscation and / or account termination. When all of the requirements are present in the blog, the dashboard Earnings wizard will activate - and the "Sign up for AdSense" button will be clickable. Until that happens, work on getting readers, search reputation, and traffic. 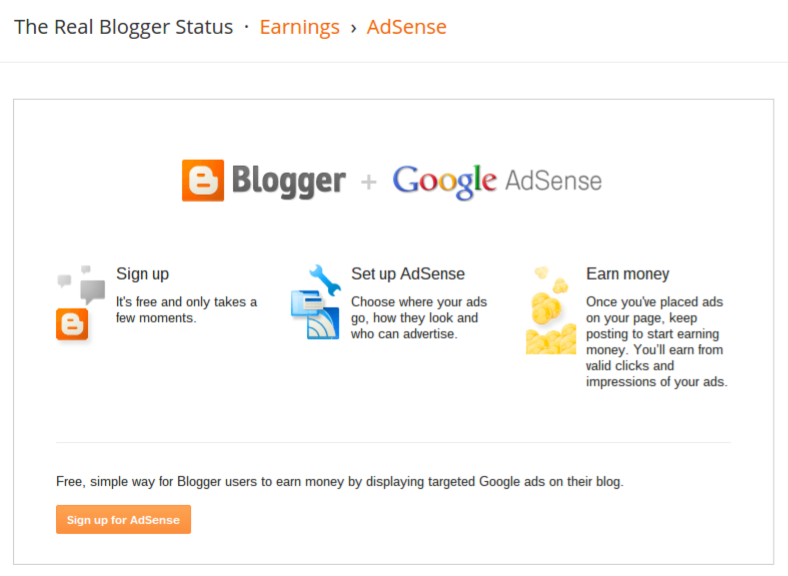 Go to the dashboard Earnings - AdSense page, and look for the button. When the button is clickable, you can sign up. Just don't do this, before you verify that the blog meets the quality standards. However you cut it, an AdSense account is not a get rich quick technique. Here are some useful references, with much more detail. You should study all of them, before applying. Note that your account - and ads - won't start, immediately. You can apply, when the "Sign up for AdSense" button lights up. You will shortly get an email from AdSense, instructing you to add the ads. Once the ads are installed, you'll have to wait for full approval, which could be several weeks. Only when the ads, and the blog, are fully approved will the ads start to show paying content - and only with the ads showing content, will you earn any money. Some blog owners may receive misleading congratulations. Right now, some blog owners are receiving congratulations - and may have blogs completely unsuitable to host AdSense ads. Custom Domain Publishing has higher standards. If you decide to upgrade your blog to a custom domain URL, be prepared for an even more selective improvement and review process. Understand The Rules Of AdSense Accounts. You can only have one AdSense account, at any time. If you already have an AdSense account, you cannot setup a second account. If you have an AdSense For Content account, you simply add the URL of your Blogger blog, as another site permitted to display your ads. 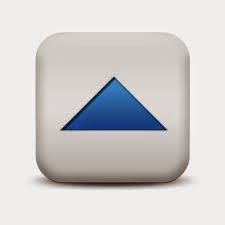 If you have an AdSense account setup under AdMob, YouTube, or a similar service, that is a Hosted account. You will have to get that account upgraded, to AdSense For Content, to display ads on a Blogger blog. If you do not have an account, and you want to host ads on a Blogger blog published to "blogspot.com", you will need a Blogger Hosted account. You can only setup a Blogger Hosted account from the Earnings dashboard page - when the blog is eligible. You cannot setup an AdSense account, from "adsense.com". If you want to publish a blog to a custom domain, you will need a full AdSense For Content account - and that will require another evaluation period. If you are upgrading an existing YouTube or other hosted account, you need a properly setup and published custom domain, or a non Google top level domain website, first. Thanks for your dedicated advice! I think my next blog will be to encourage feedback! It's one thing to see the figures in analytics, but hard to get feedback! I tied my blog to Google+ at one point, but viewer numbers dropped massively. Don't know if there's a connection, but perseverance is certainly the key, I'm sure! Anyway, thanks again ! I am not sure how AdSense handles address changes, for hosted accounts. I think you should post in AdSense - Blogger Help Forum, for best advice on this issue. thanks for your advice. My blog is over 6 months now but i still cannot click my adsense sign up button. my blog is www.skybmc.com or will i still wait for next month which ill make it 7 months, pls help and review and see if am at right track because am worried about that. I'm looking at the sitemap - which shows close to 100 posts - but started less than a month ago? You probably should be asking about this, in AdSense Support - where the many helpers can suggest more specific things to look at. Thanks much i have adsense that is used in youtube channel, as i have activated it in blogger i havent seen any ads but it its my hope that they will accept me due to the reason that in one week ihave more than 350 Views. how do yuo say about this i need your advice. Thanks a lot.I am a new blogger. I don't know so much about Adsense.But by this post, I have learned and so happy.Once again thanks.